In Genesis 1:1, and in over 2700 other places in the Old Testament Scriptures, the uni-plural noun “Elohim” (H430) is the Hebrew word that “God” chose to describe Himself. 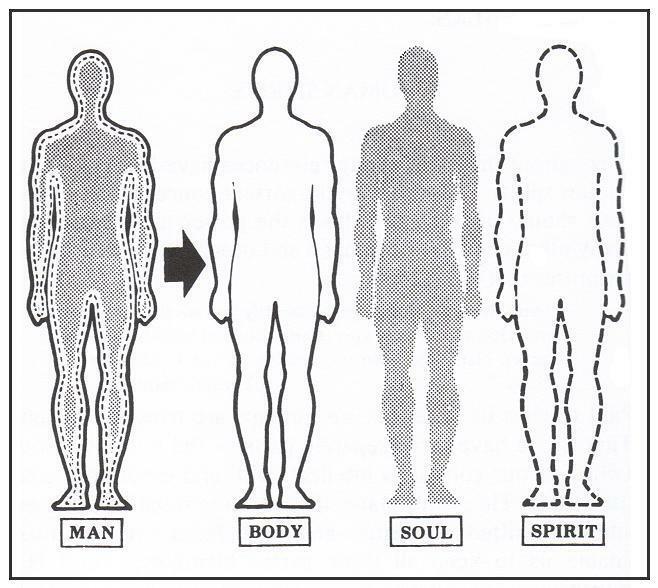 You see in 1 Thessalonians 5:23, Brother Paul teaches us that man was made a “tripartite being” with three (3) separate parts – body, soul, and spirit. In fact, Brother Paul plainly states that “all three (3)” must be cleansed and committed to Jesus in order to escape God’s wrath. Jesus is the only One that can enable man to keep all three (3) parts “blameless” until His return. The “three (3) are one (1)”, but yet the three (3) are distinct individual parts that make up the one (1). “Jehovah” or “Yehovah” is the Name of God… but it hasn’t always been! It was somewhere around the 13th century that the term “Jehovah” first appeared when Christian scholars took the four (4) consonants of God’s Name – “YHWH” – and added vowels to produce the “Yahowah” pronunciation and it’s Latinized spelling of “Jehovah”. #1) The first letter, which is pronounced “Yod”, is the 10th letter of the Hebrew alphabet and has the numeric value of ten. It is symbolic of the First Person of the Godhead – the “Father”. Suspended in mid-air, Yod is the smallest of the Hebrew letters, the “atom” of the consonants, and the form from which all other letters begin and end. [The first dot with which the Scribes first start writing a letter, or the last dot that gives a letter its final form – is a yod. (Likutei Maharan).] In the Jewish mystical tradition Yod represents a mere dot, a divine point of energy. Since Yod is used to form all the other letters, and since God uses the letters as the building blocks of creation, Yod indicates God’s omnipresence…Since Jesus upholds the world by the Word of His power (Hebrews 1:3), and Yod is part of every Hebrew letter (and therefore every word), Yod is considered the starting point of the presence of God in all things – the “spark” of the Spirit in everything. #2) The second letter, which is pronounced “Hey”, is the 5th letter of the Hebrew alphabet and has the numeric value of five. It is symbolic of the Third Person of the Godhead – the “Holy Spirit”. According to the Jewish mystics, Hey represents the divine breath , revelation, and light (the word “light” is mentioned five times on the first day of creation (Gen. 1:3-4), which is said to correspond to the letter Hey). Since the numerical value of Hey is five, this corresponds on a physical level to the five fingers, the five senses, and the five dimensions. On the spiritual level it corresponds to the five levels of the soul (instincts, emotions, mind, bridge to transcendence, and oneness). #3) The third letter, which is pronounced “Waw” or “Vav”, is the 6th letter of the Hebrew alphabet and has the numeric value of six. It is symbolic of the Second Person of the Godhead – the “Word/Son”. 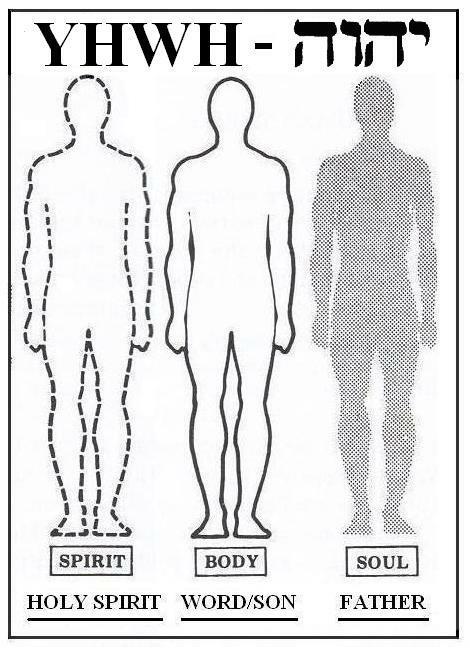 - By joining heaven and earth (הַשָּׁמַיִם וְאֵת הָאָרֶץ) it implies the connection between spirituial and earthly matters. - Since it occurs as the 22nd letter in the Torah attached to the sixth word, אה (et), it alludes to the creative connection between all the letters. Vav is therefore the connection force of the God, the divine “hook” that binds together heaven and earth. So there you have it! God’s Name (The Name of God) spelled out in four Hebrew letters, with each being representative of a Member of the “Triune Godhead”. However, seeing how “tri” means “three”, why do you suppose it took four Hebrew letters to accurately portray this “Picture of God”? I mean after all, one of those three Hebrew letters was used two different times. Well it all goes back to the fact that somewhere around 3 BC the “Word” in Heaven became the “Son” on Earth. However, in order for that to happen, God had to restructure His Triune Godhead. You see when the Second Person of the Godhead – the “Word” – was in Heaven with the Father, the descending order of the Godhead was the Father, the Word, and the Holy Spirit. However, when the Second Person of the Godhead – the “Word” – became a “Flesh and Blood” human being on earth – the “Son” – the descending order of the Godhead suddenly changed to the Father, the Holy Spirit, and then the Son. But then came another change. Because it was after His “death, burial, and resurrection” that Jesus returned to Heaven, once again, to sit at the Right Hand of His Father. In other words God’s “Three In One” is now back to the original order: the Father, the Word, and the Holy Spirit. So, you see it’s only because of the “sin of man” that these changes in the Triune Godhead were deemed necessary by the Almighty. In other words “God so loved the world” that He turned Heaven upside down in order to save it from the everlasting burning fires of Hell. And of course that’s the reason “God’s Name” uses four Hebrew letters instead of three to show us who He is. So regardless of what the Devil might say, the Scripture is clear on the fact that there are Three (3) in Heaven – the Father, the Word, and the Holy Ghost – and these Three (3) are One (1). That’s the way it was in the beginning, and that’s the way it is now. But what about when the Word became the Son? So, without a doubt, the Word of God contained in His Holy Bible (King James Version) documents the proof that the “uni-plural” God “Elohim” (H430) is One God made up of Three Parts – “Father, Word/Son, and Holy Spirit” – as exemplified by the three (3) Hebrew letters used in the spelling of His Holy Name: “Yahweh/Yahveh” (H3068). The Father was in heaven all the time Jesus was on earth (Mt. 5:16, 48). Christ now sits at the right hand of the Father. Two Lords are mentioned sitting side by side (Ps. 110:1, 5; Mt. 22:44; 26:64; Acts 2:33-34; 7:54-56; Rom. 8:34; Eph. 1:20; Col. 3:1; Heb. 1:3, 13; 8:1; 10:12; 12:2; 1 Pet. 3:22; Rev. 22:3). Jesus said He would confess men BEFORE MY FATHER, proving He is not the Father (Mt. 10:32; Rev. 3:5). Jesus always prayed to the Father as a separate person (Mt. 11:25; Jn. 17). The Father existed OUTSIDE the body of Jesus, so He could not be Jesus, (Mt. 2:12; 3:17; 17:5; Jn. 12:27-30). Both Jesus and Satan refer to a God separate from "Jesus" (Mt. 4:6-10). God was the Father of Jesus, not Jesus, Himself (Eph. 1:3, 17; 3:14). In parables Jesus illustrates His relationship to the Father as that of separate persons (Mt. 21:33-46; Jn. 15:1-8). Men are taught to go directly to the Father and not to pray to Jesus (Jn. 14:12-15; 15:16; 16:23-26). The Father knew things Jesus did not know (Mk. 13:32; Acts 1:7). Others saw Jesus as a separate person from the Father (Dan. 7:9-14; Acts 7:56). Jesus committed His own spirit to the Father, not to Himself (Lk. 23:46). Jesus claimed that He came FROM God and WAS GOING BACK TO God (Jn. 8:42; 16:5; 10:36; 17:8). God is a Spirit and not flesh and blood, like Jesus was (Jn. 4:24; 19:34; Mt. 16:17; Lk. 24:39). Men on earth with Jesus heard God speak as a separate person FROM heaven (Mt. 3:17; 17:5; 2 Pet. 1:16-18). Jesus claimed to be the Son of God, not the Father, Himself (Jn. 5:17-35). Jesus called the Father My God even after the resurrection (Jn. 20:17; Rev. 3:12). Jesus called God My Father 57 times (Jn. 15:1; Rev. 2:27). How could He be His own God and Father and beget Himself? When Jesus was born on earth angels and men still recognized God in heaven (Lk. 2:7-16). Were they mistaken about God? Was the child all of God on earth and was He in heaven also? Mary and Joseph acted with utmost ignorance if the baby Jesus was all of God, for they presented Him to the Lord Who was someone other than Jesus (Lk. 2:22). Simeon had a revelation and guidance from the Holy Spirit that Jesus was not the only member of the Godhead (Lk. 2:26-33). John the Baptist knew the Father, but he did not know the Son (Jn. 1:31-34). The Son died, not the Father (1 Cor. 15:3; 1 Pet. 2:24). Jesus was the only begotten Son of the Father, so He could not be the Father or the begetter of Himself (Jn. 1:14). Jesus claimed that He could not and did not do any thing of Himself, but that the Father worked through Him (Jn. 5:19, 30; 6:38; 8:28; 12:49-50). He did not come to do His own will, but that of Father who sent Him (Jn. 5:30; 6:38). His doctrine was not His, but the Father's (Jn. 7:16-17; 8:26). He did not speak of Himself, but of the Father had sent Him (Jn. 7:16-18; 8:26-40). He did not please Himself, but the Father (Jn. 8:29). He was a Son, not a Father over the house of (Jn. 8:35-36; Heb. 3:6). He had the same relation to His Father that men have with Satan (Jn. 8:16, 35-44; 9:4). He honored the Father as all men should (Jn. 8:49). He did not seek His own glory, but that of the Father (Jn. 8:50-54; 17:4). He knew the Father, but was not the Father (Jn. 8:55; 10:15). He was loved of the Father as a separate person (Jn. 10:17-18). He kept the Father's commandments and they were not His own (Jn. 12:49-50; 15:10). His disciples were given to Him by the Father (Jn. 10:29; 17:1-25). He was equal with the Father in some things, but not in others (Mk. 13:32; Jn. 5:17-39; 8:13-19, 29-42; 19:18-29; Acts 1:7; 1 Cor. 11:3; Rev. 1:1). He and the Father were in unity and in each other in the same sense believers are to be in unity and in God (Jn. 10:38; 14:10-11,23; 17:11,21-23). He was the only way to the Father (Jn. 6:37; 14:6). He said, I am not alone or the only witness of My sonship. The Father is another witness (Jn. 5:36-38; 8:13-19, 54; 12:49-50; 14:10-11). Over 80 times Jesus affirmed that He was not the Father and not the only person in the Godhead. Christ was the speaker, but not the one spoken of or to (Ml. 7:21; 11:27; 18:10,35; Lk. 2:49; Jn. 5:17-43; 8:19-49; 10:17-37; 14:7-28; 15:1-26; Rev. 1:1; etc.). Is it any wonder that the Godhead, the Trinity, and the unity of God are so mysterious when we force separate persons to become only one person, all because we do not want to recognize the true meaning of the word one as referring to unity, not to individuality in some scriptures? Men would be just as great a mystery if we forced the meaning of all men to refer to one person. He was not as great as His Father (Jn. 10: 29; 14:28. Cp. 1 Cor. 11:3). The Father (Mt. 3:17), Jesus (Jn. 10:36), angels (Lk. 1:32-35), demons (Mk. 3:11; 5:7), and apostles (Mt. 16:16;Jn. 1:14; Rom. 8:32; 2 Jn. 3), all declare the sonship of Jesus, but not once do they declare a Christ-fatherhood. The Father and the Son spoke to each other in audible voices at the same time and place being heard by many witnesses (Mt. 3:16-17; 7:5; Jn. 12:27-30; 2 Pet. 1:17). In no single instance could such speaking be explained as the voice of one individual or be used to prove one person in the Deity. The word both is used of the Father and the Son, proving two persons (Jn. 15:24; 2 Jn. 9). The word also is used of the Father and the Son, proving two persons (Jn. 5:19, 27; 8:19; 13:32; 14:1). The statement, "They have not known the Father, NOR ME" proves two persons (Jn. 16:3, 5). Christ received all power in heaven and in earth (Mt. 28:18). Someone had to be greater than He was to give Him that power. Who was it (Jn. 14:28)? Jesus was resurrected and exalted by the Father, so He could not be the Father (Eph. 1:20-23; Phil. 2:9-11; Heb. 12:2; 1 Pet. 3:22). God made Jesus both Lord and Christ (Acts 2:33-36). Six times in Jn. 14:1 -9 Jesus made it clear that He was not the Father. The Holy Spirit is another from both the Father and the Son (Jn. 5:32; 14:16-17,26; 15:26; 16:7-15). It was necessary that Jesus go away so that the Holy Spirit could come (Jn. 16:5-15). He has been seen with the natural eyes as a separate person from the Father and the Son (Mt. 3:16-17; Jn. 1:31-34; Rev. 4:5; 5:6). He is symbolized as a separate person with Christ, both of them before God who sits on a throne (Rev. 1:4-5; 3:1; 4:5; 5:6). He could not be sent from God until Christ was glorified, but would then be sent from both the Father and the Son (Jn. 7:37-39; Acts 2:33-34). He was sent from the Father to endue Jesus with power, which required three persons: the one who sent Him, the one being sent, and the one who received Him (Acts 10:38; Isa. 11:2; 42:1-7; 61:1-2). A clear distinction is made of the names of all three persons (Mt. 28:19; 2 Cor. 13:14; 1 Jn. 5:7). A clear distinction is made between the Son who prays, the Father to whom He prays, and the Holy Spirit for whom He prays (Jn. 14:16). A clear distinction is made between the Son on the right hand of the Father, the Father on the left hand of the Son, and the Holy Ghost who is sent from the Father and the Son (Acts 2:33-36; 7:56: Jn. 14:16-17,26; 15:26; 16:7-15). The Son was already given (Jn. 3:16), when the Spirit was not yet given (Jn. 7:39). The Son can be blasphemed with forgiveness possible; but if the Spirit be blasphemed no forgiveness is possible. This proves two distinct persons (Mt. 12:31-32; Mk. 3:29-30; Lk. 12:10). The Samaritans received Jesus, but had not yet received the Holy Ghost (Acts 8:5-25). Jesus could do no miracle by Himself (Jn. 5:19), but by the Holy Ghost He did many miracles (Jn. 2:11; Acts 10:38). The Holy Ghost came not to speak of or glorify Himself, but to speak of and glorify Jesus (Jn. 16:7-15). The descent of the Holy Spirit proved the arrival of Jesus in heaven to sit at the right hand of God, thus proving three persons (Acts 2:33-34; Jn. 7:39). Jesus claimed even after the resurrection that He was not a spirit being, so He could not be the Father or the Holy Spirit who are spirit beings (Lk. 24:39; Jn. 4:24; 14:16-17, 26; 15:26; 16:7-15). In the last book of the Bible the Trinity is seen as working together in all things (Rev. 1:4-6; 3:1: 4:5; 5:6; 21:10; 22:17). Yahweh, God Almighty, is Three In One!! !